I’m quite a fan of the Fit. 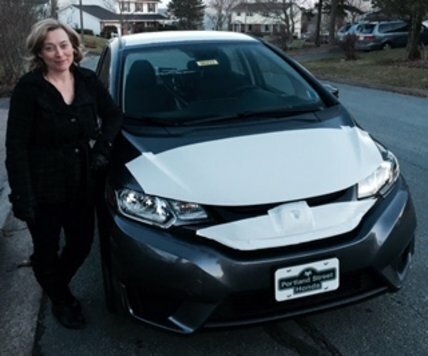 It is with that in mind that, on an overcast #Fit #Friday earlier this month, I grabbed the keys to a brand new 2015 Fit LX and drove over to visit my mother. I have a lot of respect for my mother; she’s a clever lady. One thing she is not, however, is a car enthusiast or expert. Like most of us, she is an average car buyer. Which, I believed, would make her the perfect judge of the 2015 Fit LX. After a surprisingly lengthy discussion on why I decided to wait until tea time to come for a visit, she agreed to go out for a test drive. The only rules she put in place were that we were not to drive in traffic or on the highway (this is a test drive though, so we did both of those things). As we approached the car, I began to explain how the Fit had been re-designed for 2015, and how it was one of Honda’s most popular vehicles. 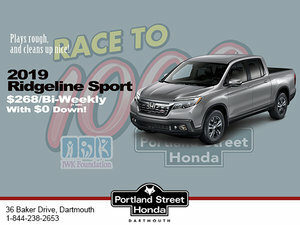 I went on to describe how she would be amazed by the cavernous amount of storage that Honda had packed into the car, at which point she stopped me and said “Wait, you don’t know anything about cars...”(Thank you to the Sales Team at Portland Street Honda for giving me all the answers I would need in advance). We were obviously off to an excellent start. We began to drive through the sleepy neighborhood of my youth. My mother then turned to me and said “Does this have heated seats? Cause it’s gonna be a deal breaker for me if it doesn’t have heated seats.”. I told her it did, and pointed to the button on the center console. Once her heated seat was activated my mother turned and looked to the back seat. She continued to look at the back seat silently for a few moments and then finally asked “do the seats come down?”. I nodded my head “yes” and told her that they are incredibly simple to operate and lay flat (I would later demonstrate this for her). My mother then turned her attention to the screen on the dashboard. “is this a back up camera?” she asked gently pointing to the power button. I told her yes and said that it was also a touchscreen infotainment system. “Really?” she asked, “I don’t know how to use those.” I explained that because it was a touchscreen it operated pretty much like her iPad, and that the backup camera would turn on automatically, this put her at ease. I then explained that she would also be able to connect her devices with Bluetooth, USB and even HDMI...but this was lost on her, so we stopped talking about technology. As we continued to drive she saw a Honda Civic SI in traffic and commented that she really likes the Civic. “I had a Honda Civic, and I drove it for years, it was the best car I ever owned and I’m not just saying that.” I responded with “well yeah, but this is a Fit.” and she said “yeah this is nice too”. At this point, I began to explain that Honda builds all their vehicles with an enormous amount of attention paid to safety. The windows are a consistent focus with the design of each Honda model, but the Fit is well known for the exceptional range of visibility it allows for the driver. She responded with “Are you going to try to sell me this car now?” and laughed at me. As we drove onto the highway, I began to describe the exceptional fuel range available on the Fit thanks to the Honda Earth Dreams technology powering the engine. She smirked and said “I don’t know what that means”, and I replied “I know that’s what I’m about to tell you.”. I told her that the engine uses direct fuel injection to ensure that the vehicle can burn less gas, but not sacrifice performance. “You can travel further because you have the same power (often more) than before, but you're doing it in a more efficient way (which is also good for the environment).” As I explained this, she leaned over to see that we still had a full tank of gas, she then gave me a thumbs up of approval. Once home, my mother exited the vehicle, mentioned how eager she was to return to her cup of tea and reminded me that there would be family dinner at the house on Saturday. I thanked her for going for a drive and headed back to the dealership.